The album is deliberately created with an idea to apprehend, to feel and to get into contact with your chakras. Chakras are energetic centres of your body, which distribute energy between energy bodies, chakras correspond to their certain energy body and its interconnection with organs and systems of the physical body. Chakras have a great impact on physiology, health, behaviour and perception of the world. The energy work with chakras is widely practices in the Indian yoga and Tantric Buddhism. 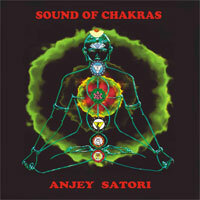 The disc contains special sounds, which activate and charge corresponding chakras with energy. For a better practice it is recommended taking position of Lotus or any position in which your backbone stays in vertical state during meditation. During listening to the vibration, try to focus your attention on area of your body which chakra corresponds to. In the last composition each bell stroke moves your conscious from the upper chakra Sahasrara into the lower chakra Muladhara. If you listen to Chakra Sounds regularly you will have feelings of nice vibration and balance in all your body and also you will have a sense of energy recharge.